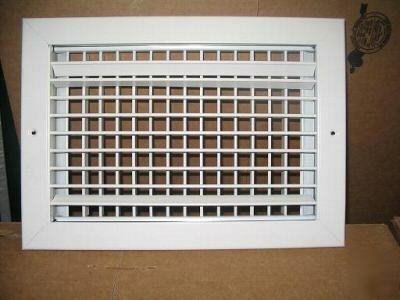 Double deflection supply grille (324 grilles) "lot"
Subject: Double deflection supply grille (324 grilles) "lot"
Any questions Call . Ask for Dan. If you would like a smaller quantity let me know for pricing. I have a quantity of 324 of these grilles. They are all 24" x 6". -This is a double deflection grille with individually adjustable horizontal and vertical blades. -Frame and blades are 6063 extruded aluminum alloy with 200-R1 satin anodized finish.The frame has a typical wall thickness of .050'' and is seperated from the blades with injection-molded nylon bushings...this method of assembly eliminates corrosion and vibration. The frame mounting holes are dimpled, allowing for a conuter-sunk fastner head appearance. -All blades are airfoil in design, individually adjustable and spaced 3/4'' on center. At the outer edge of the frame is a specially engineered channel which retains an extruded flexible vinyl bulb gasket that produces a positive air seal at the mounting surface, minimizing smudging.